A wild night unfolded in Junction, Texas on night one of the Hill Country Fair Association’s Summer Classic Bull Riding event. As most of you know, an oppressive heat wave is wrecking havoc upon Texas these days. The heat apparently had no effect on the bucking bulls and was particularly difficult for the riders-only five bulls were ridden out of 41 attempts for the evening. Notable buck-offs included: 2008 CBR World Champion Clayton Baethge, PBR Top 15 Cowboy Jordan Hupp and 2012 CBR Horizon Series Tour Winner Cody White. PBR World Cup Team Mexico Captain Francisco Morales was evening one’s winner as he was the only rider to make qualified rides in both the long and short round. His long round bull, Darryl Ray Thompson’s 730 “Pop-a-Top”, was quite unfriendly in the bucking chute. Before the ride even began the bull reared backward and crushed Morales into the back of the chute and then flipped completely around-requiring some crafty repositioning by the event staff. After getting re-situated Morales put together a solid ride for 79 points. In the short round the Mexican cowboy, Morales, drew J.D. Nix’s 911 “Private Party.” This ride was an example of how never quitting the ride can pay off. Morales gutted out a 77 point ride that didn’t look very pretty, but put a considerable amount of money in his pocket. This is a lesson everyone should heed: sometimes ya’ just gotta’ win ugly! Our high marked ride of the evening was from Juan “Stick” Alonzo from Mt. Calm, Texas marked 84 points in the long round on Diamond Cross Rodeo’s 524 “Cedric.” Although he bucked off his bull in the short round, Alonzo’s effort was enough to garner second place for the evening. The “Wild” of the evening came in the short go-round when the bucking bull “Wacey” decided that he no longer wished to be subject to the confines of our theater of dirt and steel. “Wacey” bucked off John Huffaker of Kerrville, Texas in very short order and then found a low spot in the fence where he made a break for freedom. Our safety riders, J.W. Tucker and Charlie Hellen made haste to pursue. J.W. Tucker soon roped the fugitive “Wacey” in the infield of the famous Junction racetrack. 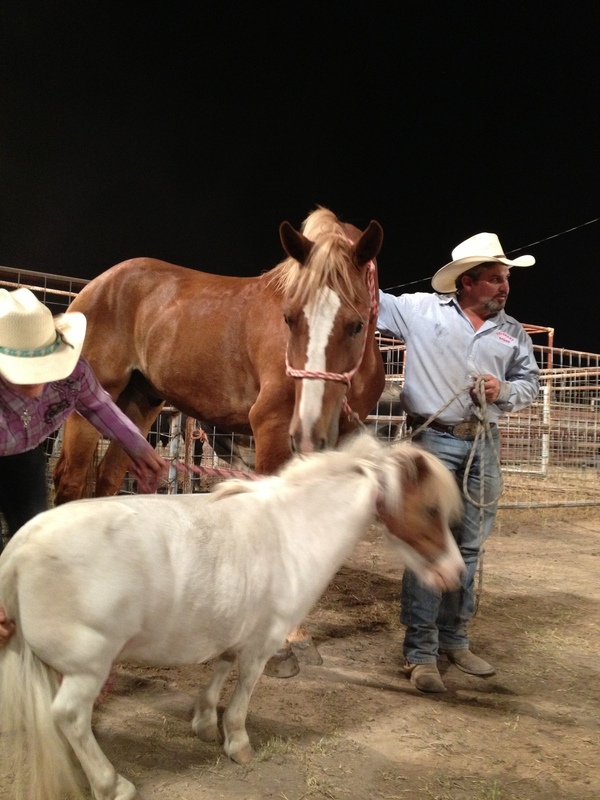 It brought the house down when Tucker returned, victorious, to the arena with “Wacey” in tow. Night two of the Summer Classic is quickly approaching. Come on out and join us at 7:00 p.m. on Saturday night to see what happen’s next! ← Junction Summer Classic Bull Riding-This Weekend!